Do you love popcorn? It is definitely a favorite in our house! 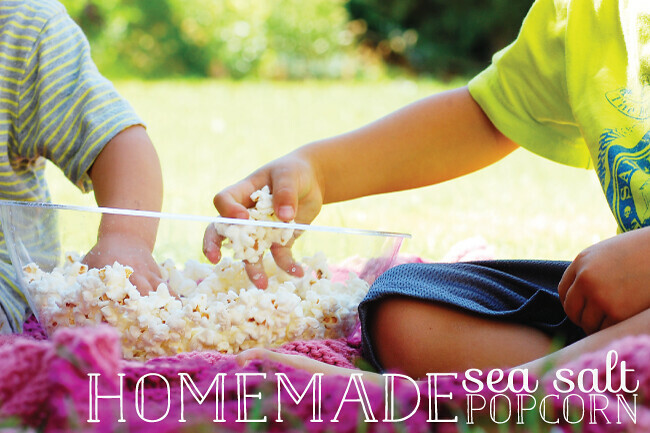 Today’s guest post is for all the popcorn lovers out there as Brenda, from the blog From Me, With Love, is here to share her technique for making sea salt popcorn. Hello Just Us Four readers! I am so excited to be here today. My name is Brenda from From Me, With Love. I blog about design, life and style. I am a mommy to three little ones (4,2,1) and have an Etsy Shop where I sell prints for the home, party invitations and printables, and stationery. All those things keep me pretty busy! But busy doesn’t have to mean I don’t have time for the fun things. I love spending time with my children and making yummy and healthy treats for them. Doesn’t it seem like kids are always hungry?! 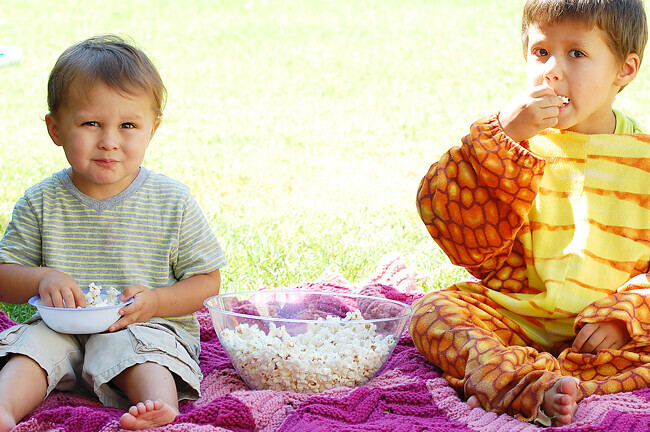 One of my favorite and simple snacks for after lunch/after nap time is popcorn. And it only takes 3 minutes! I know what you guys are thinking- a recipe for homemade popcorn? It’s not rocket science. And I get it- I used to make popcorn (A LOT) with olive oil and salt or would buy microwave popcorn. After I discovered coconut oil I modified my recipe a bit and it is ah-maz-ing. Give it a try! You will start to hear the kernels popping- keep on shaking! Shake every 30 seconds or so. I used to make this almost every night the last 4 months of my pregnancy. I would eat the whole bowl. No joke! And I wouldn’t share with my husband…evil pregnancy hormones. The reason I mix in the salt with the coconut oil is because if I wait until the kernels have popped then the salt has nothing to stick to and just falls to the bottom. Plain popcorn is alright but the bursts of salty goodness make this popcorn so dang delicious. My kids love it and I don’t feel any guilt giving them this. Coconut oil is healthy and gives it a slight taste of coconut-y flavor. What fun things do you guys put in your popcorn? Thank you, Shannah for letting me stop by today. I hope you guys enjoy some homemade popcorn as a nice relaxing snack. If you are looking for something healthy and just as yummy try Salad Savoy Chips or these Strawberry and Watermelon Popsicles (ice cream optional). I’d love for you guys to stop by and say hello on facebook, see some sneak-peeks of projects on instagram or find my favorite things on pinterest! We have been making a lot of stove top popcorn in our house lately. Love the stuff! Stove top popcorn is so good! This looks awesome! 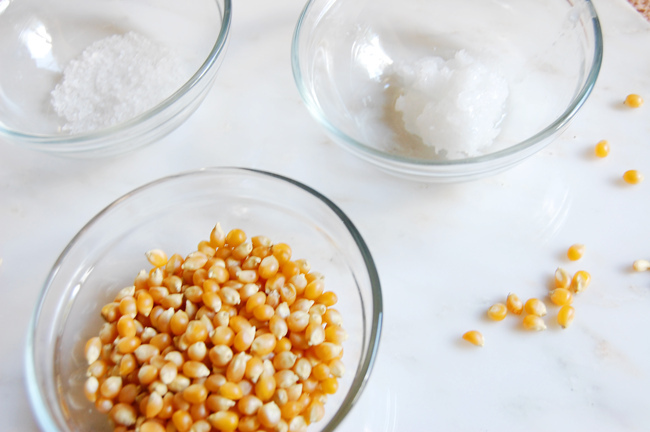 I love making popcorn at home; pinning this, and thanks for the recipe! I love homemade popcorn too. It is just so much better than microwave in bag popcorn. Haven’t tried sea salt on it yet but will after reading this! Doesn’t that sound so wonderful?! I love homemade popcorn. Haha…doesn’t that popcorn just make you want to pop a whole bowl?